Football Without Fans Is Nothing: Accurate or Ignorant? 'Football without fans is nothing.' It's a statement which has been seen and heard a lot recently as the 'price of football' continues to rise, with supporters feeling the effects of such an increase in tickets, food and travel. Fan culture or spectatorship in Britain has helped sport grow into one of the country's most important social, economic, cultural and even political exercises. From football's codification in 1863 to modern day super stadiums supporters have been at the heart of the game's highs & lows - never being too far away from the headlines. Sometimes fan culture appears to be a relatively new idea springing up from the 1970s as hooliganism and commercialisation took its hold but as we will read here, for as long as the beautiful game has existed so have supporters - how else did the sport dominate the globe? Whilst at Swansea University, Gareth and I studied British Sport and Society, 1860-1960 - a course which inspired many of the pieces The Football History Boys have put together. One aspect of the module was looking closer at spectatorism throughout the period studied. Something which surprised the pair of us was the stark similarity from articles in c.1900 to the ones we read today. It is often said by football's romantics that the 'game was better 50, 60, 70 years ago' - it was seemingly pure, free from boisterous fans and negativity. But this statement couldn't be more inaccurate. In this piece I am going to delve deeper into spectatorship and the role it has played throughout football's history - as we will see, from day one it has seen positives and negatives to split popular opinion often to incredible ends. It is an article from 1904 which has inspired this piece. The article in question is called the 'Football Fever' found in MacMillan's Magazine. H.F.Abell's work has been used by a vast array of sports historians over the last twenty-five years as a means of highlighting the stark similarities in the sport, both past and present. Throughout the article it is evident that players were no strangers to 'encouragement' from the touchlines and the referees were not exactly immune to the wrath of irate supporters.
" There is enthusiasm, plenty of it, but it is an ungenerous, one-sided enthusiasm, without a spark of chivalry or appreciation of alien worth in it. Once at a famous North Country ground I saw and heard half a crowd of 20,000 people turn upon a poor referee who had done something distasteful, while the other half applauded his action. The spiteful yells which arose, the torrents of foul abuse which were poured forth, the fierce brandishings of sticks and fists, the almost carnivorous expression on the passion- deformed faces, made up a terrible picture of an English crowd taking its pleasure on a Saturday afternoon which I shall never forget." Abell's piece has a strong theme of class running through it. Football for as long as it has existed has been a sport adopted largely by the working-classes. This isn't to say that those of greater wealth were not fond of the pastime - football's original rule book was drafted by public schools during a meeting in London and most clubs by 1904 were run by middle-class businessmen. Class and spectatorship however go hand-in-hand, seen prominently by the emergence of the Football League in 1888. Prior to its founding, the nation's major tournament 'The FA Cup' was generally dominated by public schools and their alumni. Northern clubs undoubtedly brought with them a sense of local identity, and sides which represented the community on a national scale. Jeff Hill has noted the 'invasion' en masse of Northern clubs on London for the FA Cup Final once a year - thanks in part to cheap rail travel. This highlighted the power the game had - gradually becoming one which represented a 'physical manifestation of the English nation.' This idea of identity is still widely seen today with local rivalries and often a north/south divide still evident. 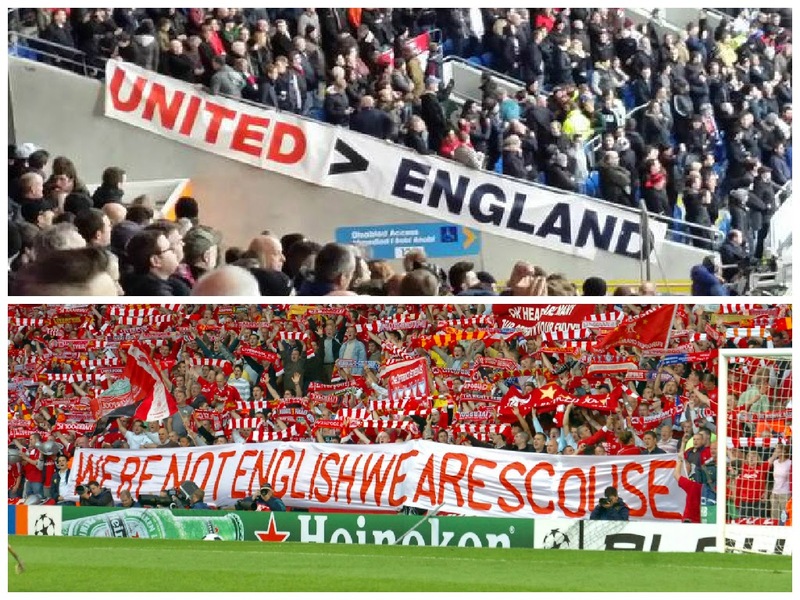 For example in a match between Liverpool and Manchester United it would be no surprise to hear Liverpool fans parading a banner saying "We're not English, we are Scouse" - with their Mancunian counterparts favouring a "United > England" approach. Banners and songs exchanged between teams can also highlight a strong sense of identity often to volatile ends, but these examples have one thing in common - for many football supporter the allegiance to their club often outweighs that to their nation. It is the idea of identity and a sense of belonging that is perhaps the most vital aspect of spectatorship. The Old Firm in Scotland sees two clubs of the same city battle it out on the pitch (rarely off it) but also two clubs which couldn't be more different in terms of identity. It offers the sectarian divide with its roots found deep in religious beliefs - Catholic and Protestant. 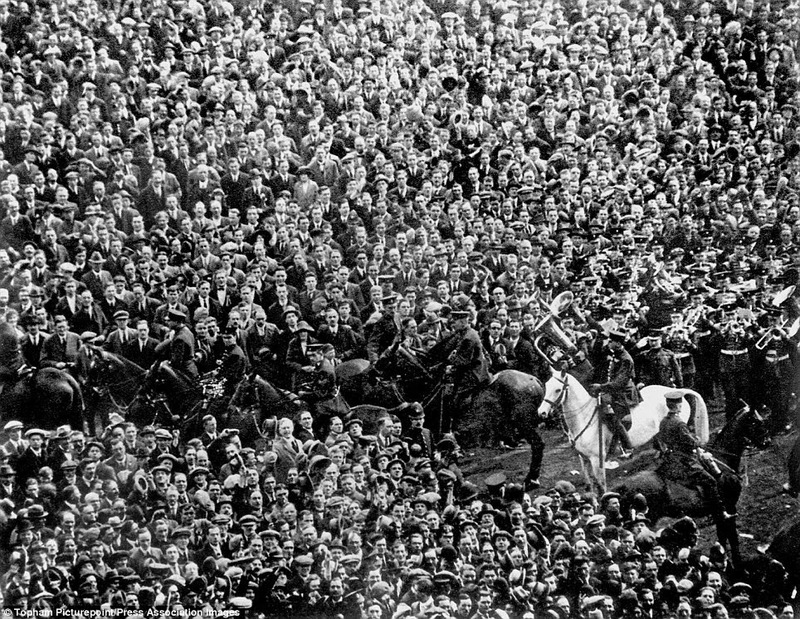 Perhaps the most significant example of the early power spectatorship offered was at the 1923 'White Horse' FA Cup Final at Wembley. It truly is a game in which the line, "let the pictures tell you everything" could not be more valid. The game has since been remembered more the sheer amount of attendees than the actual match. Amid such chaos it would be no surprise to see disorder and potentially violence amongst supporters. However, this was simply not the case, nor was the myth that one policeman on his white steed managed to clear the crowd single-handedly. In fact, Jeff Hill notes that the fans were in fact, "self-disciplined, peaceable and essentially cooperative," a true embodiment of the English people. Amid scenes unparalleled in the history of Association football, or, indeed, of any other game, Bolton Wanderers scored two goals to nil at Wembley on Saturday and won the Football Association Cup in remarkable circumstances. Such enormous interest had the contest between West Ham United and Bolton Wanderers aroused, besides the wonderful descriptions circulated about the great Stadium at the British Empire Exhibition grounds, that a record crowd was certain. At three o'clock, when the King arrived and play should have begun, the whole playing arena was covered with people. "The attendance of women at football matches has recently occupied some attention in several ladies' journals. A writer this week says: It would involve no great sacrifice, and be very much more creditable to the six which is supposed to be all gentleness and sympathy and tenderness, if women would I discontinue their attendance at football matches. Football may or may not be a "manly" sport, but it is certainly not one which women, who should be " tender over drowning flies," ought to take pleasure in witnessing. Women undoubtedly lose their influence over and attraction for man when they dispossess themselves of their womanly attributes." Football spectatorship continued in its thousands after the Second World War - with women gradually being a more acceptable presence at matches. The 1950s brought with it a new age of affluence and an increase in disposable income and leisure time - meaning football attendances could peak. Sports Historian Matthew Taylor notes that during the initial post-war years football enjoyed a higher public profile and a greater popularity. This was seemingly the final throw of the game before the intrusion of television and the gradual commercialisation which turned the game into a business. However, Taylor also notes that this concept is not wholly accurate - in fact, 'The Football Fever' even outlines concerns for the game, fearing it may become a business. For The Football History Boys it was in 1950s that the sport truly went under its first real change - as England were outclassed by the Magical Magyars of Hungary at Wembley. It was the game in which the game woke up and began to realise that Britain was not at the centre of the world. With it came new tactics, new regimes and new opportunities for commercialisation - the role of the spectator was to change again. "Yesterday by four o'clock on a grey afternoon within the bowl of Wembley Stadium the inevitable happened. To those who had seen the shadows of the recent years creeping closer and closer there was perhaps no surprise. England at last were beaten by a foreign invader on English soil...England could be proud of its past, but it must awake to a new future”. Despite the game becoming a truly global affair after the Second World War, it was domestic uncertainty which would dominate much of the 1970s and 1980s. Why? Hooliganism. For every positive aspect of spectatorship which we have discussed the rise of the sport has brought rivalries to almost disastrous ends. Although previous perceptions of hooliganism involved a working-class background, more recent reading sees that hooligans came from a variety of socio-economic backgrounds. Holt is quick to write that violence at football is not a modern phenomenon, but the emergence of 'firms' in the 70s and 80s brought with them a thuggery which began to be seen as a direct representation to the clubs they 'represented'. The era saw the tragic events at Heysel in 1985 and the banning of English clubs from European competition. Of course hooliganism has brought with it a sense of negativity around fan culture in Britain which is still felt today. However, the press perception of football supporters being a disorderly bunch of male thugs is wholly inaccurate. In Britain it is of course still prone to the odd controversy, but modern football does still bring examples of spectatorship which really need to be counted. For example, the nationwide backing of the Justice Campaign for the 96 or the gradual movement of supporters to get fairer prices on tickets - promoting a new form of identity - us vs. them. Football has never been far away from the threat of being termed a 'business' - The Football Fever teaches us this, but modern spectatorship is increasingly coming under question as ticket prices continue to rise - it is time to learn from the European leagues and clubs like Dortmund and Bayern - for them supporters truly are at the centre of matters. So there we have it, a brief history of spectatorship in Britain. As we have read mass support for clubs has been around for as long as the game has existed - promoting ideas of class, identity and gender. At times it has symbolised the state of the nation, and in others it has been the source of disgrace, but in general, what spectatorship offers is a sense of unity and one of belonging. If the game continues at its current economically focused mindset, we could be seeing the last days of true fan involvement, and true support. One thing is for sure - football truly is nothing without fans. Thanks Ben! We'll have a look now!